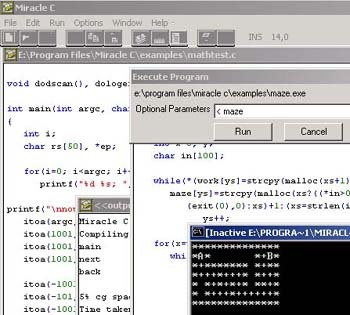 Miracle C Compiler runs under Windows (XP/Vista) and compiles for the command line. Provides a multi-window development environment with integrated compiler and linker, and online helpfile documentation. Source code to the compiler, preprocessor and linker is supplied upon registration. 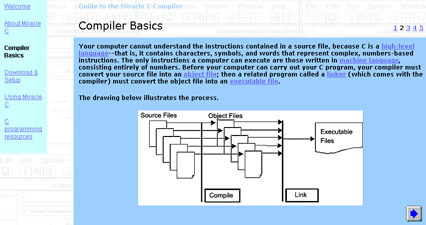 The Miracle C Compiler runs under MS-Windows targeting the command line. All traditional C syntax is implemented, including record (struct/union) and enumerated data types, int, long and floating point data types, user type definition. There is a comprehensive library of functions; some example programs demonstrating compiler features; and Windows Helpfile documentation is supplied with the package. Miracle generates object for Microsoft or compatible linker (such a link facility is builtin to the Workbench). The workbench enables the user to develop code with multi-window editor featuring syntax colouring, from which write, compile and build operations are launched. MCW is an ideal beginner's compiler due to its ease of use, while provision of source code to registered users gives an insight into real world compiler design for a common operating system. The compiler is currently at revision 4.1. If you have any questions about the current release, send feedback. If you do not have Visual C++ 2008 SP1 installed then download the redistributable. Download the mc41shr.msi file, choosing Save-to-Disk. Double-click on the file you downloaded in the previous step. Follow the installer prompts. If you have installed in a directory other than C:\Program Files\Miracle C, run the compiler and issue Options/Compiler to set the directory. You're all set! Run the compiler. Try out the example programs. Enjoy! Please look at the Miracle C Installation and Use Guide, a contribution of web-pages from a third party. (Note that in addition to this online resource, Miracle C contains comprehensive language and library Windows helpfiles). The compiler is shareware, and is supplied on a trial use basis. Programs written using the compiler may be freely distributed. Source code to the compiler itself is supplied upon registration. The registered version enables you to see how programming software works and customise it, also the reminder screens are removed, and registered users are eligible for free lifetime support in the installation and use of the compiler, as well as free updates to the product. Miracle C is under active development by the author. By registering you support further development of the compiler. Thank you for your registration!